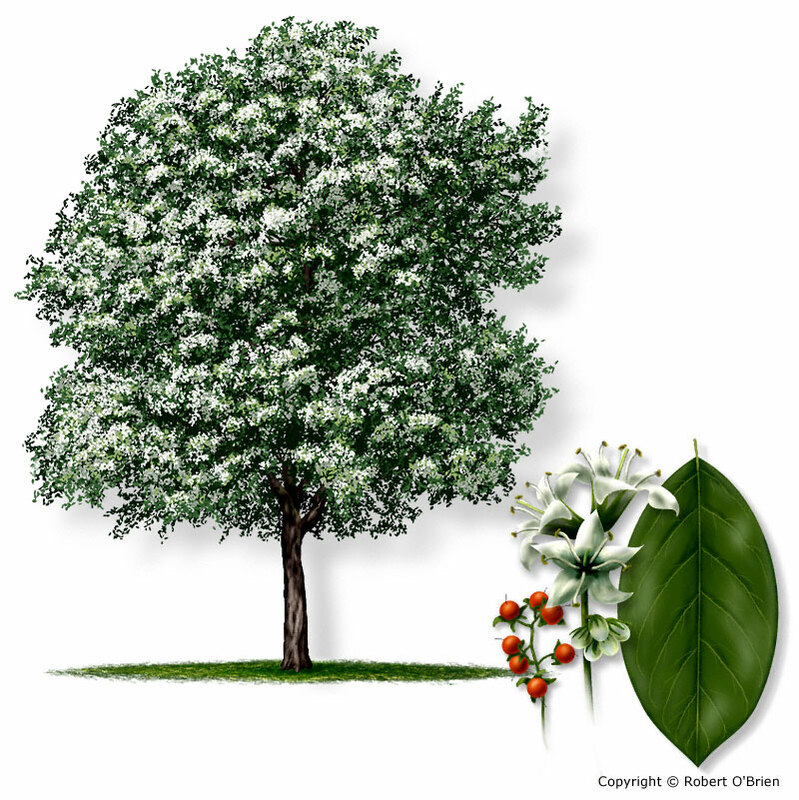 A medium-sized tree to 50 feet tall and a trunk to 2 feet in diameter, with a dense, round crown of dark green foliage. In Central Texas, south to the Gulf coast and the Rio Grande valley, especially along streams and sandy deposits, but grows well on alkaline soils. Used as a landscape tree from San Antonio to Houston and southward. Simple, alternate, 2" to 4" long and 1" to 2" wide, elliptical or oval in shape, leaf margin without teeth (or with faint teeth along top half), top surface the texture of sandpaper, lower surface pubescent with coarse veins. Leaves are dark green, turning black following a hard frost. Short clusters of small, white, fragrant flowers appear at the tips of branches from late fall to early spring, attracting great numbers of bees. A round, berry-like drupe, 0.25" in diameter, yellowish to orange-red in color, fleshy, appearing mid-summer or fall. Very messy in high-traffic landscape settings. Gray to brown, very rough, thick, with deep furrows and flat ridges on older trees. The wood is light brown, heavy, hard, and has been used for posts, wheels, spokes, axles, yokes, and tool handles. Flowers produce a light-colored honey. Cedar elm (Ulmus crassifolia) has rough leaves less than 2" long with toothed edges; anacahuite (Cordia boissieri) has longer, velvety leaves. An important component of the evergreen forest remnants along the lower Rio Grande valley.